The greatest reward at the conclusion of every project is a quality, lasting relationship. We’ve said it in the past, and we’ll say it again. Relationships are an irreplaceable asset. 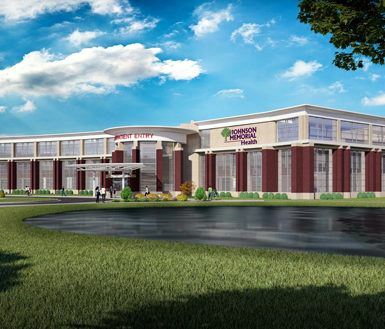 That’s why Project Director Bob Crowder is thrilled that Johnson Memorial Hospital wants to continue collaborating with their Rehabilitation Center, the first phase in their $42 million expansion project. 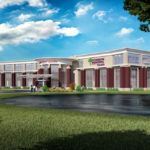 He added that the Keystone team’s understanding of the owner needs, scheduling impacts, and financial demands were also attractive to Johnson Memorial Hospital. Construction is already underway, with the building pads and layout being completed. As the Rehabilitation Center takes shape, we’re excited about a few design details courtesy of Cripe Architects: large sections of exterior glazing on the façade and a unique canopy that will accentuate the sleek exterior. The new rehabilitation center will contain 20,400 square feet that will house physical, occupational, speech, and orthopedic care services.